In our daily work we work with multiple files in Windows which are stored in different folders on our computer, some even on cloud storage such as OneDrive or Box. One of time consuming task in previous versions of Windows was users had to navigate entire tree of your folders to open or work with any file. Windows 10 addresses this with Quick access feature which helps you to access your frequently used files and folders in single click from Windows File explorer. 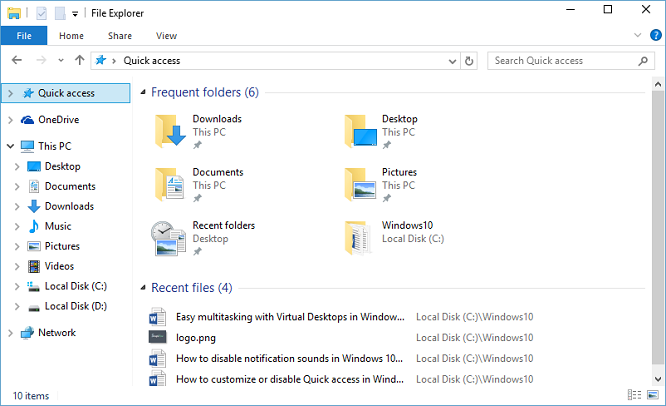 Windows 10 File Explorer has new "Quick access" option in left navigation pane. Clicking on this shows your frequently used folders and recently accessed files in content pane on right side. You can also click on ">" icon in front of Quick access in navigation pane to see frequently used folders and recent files in navigation pane itself. Frequent folders: Frequent folders section in content pane on right has few default folders with pin icon below them. These are folders like "Downloads", "Desktop", "Documents" and "Pictures"' which Windows users use very frequently. In addition to default pinned folders, Windows automatically detects your four frequently accessed folders based on your folder browsing history, and displays them here. Recent files: Recent files in content pane is list of files that you have accessed recently on your computer. When working on particular project, we normally work on only few of the files. These recently used files will be shown in "Recent Files" section and make it easy to access them. Windows 10 provides easy options to customize "Quick access" as per your preferences. You can pin new folders, remove pinned folders, remove file from recently used list, or clear your File explorer access history. You can also disable frequent folders or recent files from being displayed in File explorer. Refer below details about customizing Quick access. Windows will display your four frequently accessed folders under "Frequent folders". You can pin more folders to "Frequent folders" by right clicking on folder you want to pin in File explorer, and selecting "Pin to Quick access" from context menu. This will add and pin your selected folder to Quick access. If you want to remove any of your frequently used folder which is displayed in "Quick access", right click on folder to remove, and select "Remove from Quick access" in context menu. If you want to remove any of your recently used files listed in "Recent Files", right click on file to remove from Recent files, and click on "Remove from Quick access"
Uncheck "Show recently used files in Quick access" to disable your recently used files from being displayed in Quick access. Uncheck "Show frequently used folders in Quick access" to disable your frequently used folders from being displayed in Quick access. 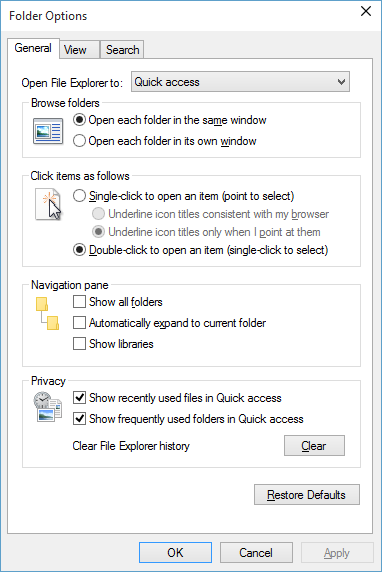 If you want to clear your file and folder access history, Open "Folder Options" dialog and click on "Clear" button in front of "Clear File Explorer history". Open new File explorer window under "This PC"
In "Folder Options" dialog, change "Open File Explorer to" value to "This PC"
Quick access feature in Windows 10 is certainly cool feature to make Windows users more productive!